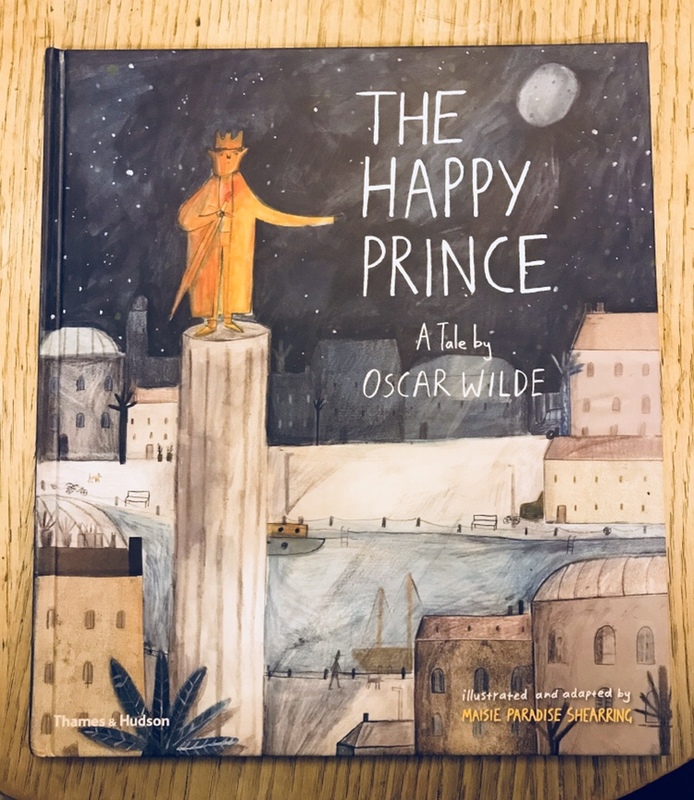 Just in time for Valentine’s Day, this month I picked a classic story about loyalty, devotion and love without boundaries – The Happy Prince by Oscar Wilde, beautifully illustrated by Maisie Paradise Shearring (Thames & Hudson 2017). I fell in love with the Maisie Paradise Shearring’s artwork when I saw this book at the Bologna Children’s Book Fair last year (Shearring won the International Award for Illustration in 2015 and the Spanish publication deal was a part of the prize). Her illustrations are so fresh and whimsical and most of all imaginative. They look naive and playful like children’s drawings but at the same time they are mature and full of sensibilities. I like her choice of the setting – an anonymous contemporary European city. I also like the way the swallow has a human-like face and a rucksack! You can watch her talking about this book on YouTube. The story is about the splendid statue of the late “Happy Prince”, who in his human life had only cared about nice things and his own happiness. Saddened by the suffering of people living in poverty and misery in the city he sees from the top of the column, the prince’s statue begins to give away his own precious decorations with the help of a swallow, until he has nothing left to give. I read this classic story when I was a kid. From my unfortunate ‘Disneyfied’ copy of the story, I got only a story of redemption and friendship. However, when I read this Shearring’s beautifully rendered version as a grown up, I realised how heartbreaking yet poignant this story really was. When the prince gives away both of his emerald eyes and becomes blind, the swallow selflessly decides to stay with him to be his eyes although cold winter was approaching. That’s love. Together they make the whole city happy. But the winter was too cold and harsh for the swallow to bear. The image of the swallow lying lifeless at the feet of the prince broke my heart in half, not just the prince’s heart of lead. The most remarkable thing about this fairy tale though is the fact that it’s a love story between two male characters (the swallow is described as ‘he’), and a statue and a bird. The message is clear: love has no boundaries. Come to think of it, this is written by Oscar Wilde. Here’s the most tender and intimate lines from the book:“Goodbye, dear Prince,” the Swallow said. “Will you let me kiss your hand?””So you are going to Egypt at last, little Swallow! You must kiss me on the lips, for I love you.””I am not going to Egypt but to the house of Death,” the Swallow said, and kissed the Happy Prince on the lips. The Happy Prince is a story of redemption and kindness as well as a social commentary on indifference and superficiality in our society, which is still very much apt for contemporary readers. But most of all it’s about love. I highly recommend this beautiful book for your loved ones.